Bournemouth goalkeeper Adam Federici says he trusted his "feeling" in saving three penalties in their League Cup shoot-out win against Preston. 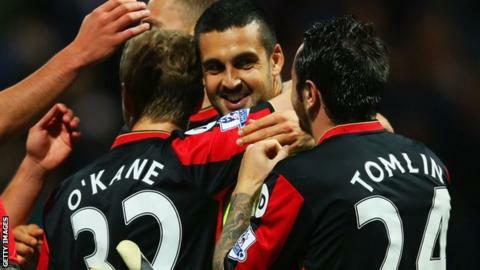 Eddie Howe's side surrendered the lead twice in a 2-2 draw after extra time before winning 3-2 on spot-kicks. "You try to wind players up a bit before penalties, but you do what you have to and go with your feeling," Federici, 30, told BBC Radio Solent. "Thankfully I got my hand on a couple in the shoot-out and they stayed out." The Australia international was making only his second Bournemouth appearance following his move from Reading in the summer. Federici is now hoping his efforts will help him in the battle with Artur Boric for the number one keeping spot. "I was confident going into the shoot-out and I'm just really pleased to have played my part as the guys worked really hard - it takes a lot out of you after 120 minutes," Federici added. "I thought I'd done well in pre-season and felt I was unlucky to miss out at the start of the season, but that's football. "I'll keep working hard, everyone knows I love playing and it's not my forte to sit on the bench."